INIA in collaboration with Caisse Nationale de Securite Sociale (C.N.S.S.) 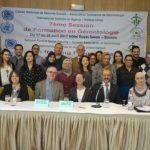 and the Tunisian Association of Gerontology (ATUGER), organised the 7th in-situ programme in Tunisia. The programme in Gerontology, which was attended by twenty-three Tunisian participants, was held from 17-28 April 2017 at the Royal Salem Hotel, Sousse, Tunisia. Apart from local lecturers, lecturing on the programme was Professor Alain Franco, Professor Emeritus, Internal medicine, Gerontology, Geriatrics and Gerotechnology, University de Grenoble, Sophia Antipolis, Nice, France.